We were feeling pretty good about things last night, even though the port engine lost RPMs and couldn’t be coaxed to rev up beyond 1800. No worries. Jack changed the fuel filter. Again. (Curse you, Isla Isabela fuel people). We switched over to the starboard engine for the night watches, meaning we could sleep in our own cabin during offwatch. So far so good. At 6am we cranked up the port engine and within minutes the RPMs once again dropped to 1800, then 1600. This will not get us to Costa Rica. Meanwhile Jack checked the fluids in the starboard engine knowing we’d have to rely on it if the port engine was a problem and wouldn’t you know, the battery was low. Again. Seems the starboard battery is getting cooked and we need to address that ASAP, but not now, for Pete’s sake! So top up the battery, start the engine, shut down the port one. Since the fuel in the tank was getting low we thought this might be a good time to transfer more of the cleaner Santa Cruz fuel and dilute whatever is clogging the fuel lines. So Jack schleps the tanks in their two-part emptying sequence, half at seat height, the rest at bin height. With that done, Jack went down to see what’s up with the port engine. Fuel filter’s clogged again and our supply of filters is dwindling. What’s more there’s a leak around the vent screw on the fuel pump. Seriously?? No matter what Jack tries he can’t get it to stop leaking. The screw appears to be broken off inside. We’re sure we have replacement screws and the little copper washers but do you think we can find them? Of course not. With the anger only a non-mechanic can feel for a balky diesel engine, Jack jammed the screw in as well as he could and seems to have stemmed the leak, but it’s definitely not right and we’re reluctant to use that engine. Meanwhile, the starboard engine is putting out white exhaust. Please. We have only 111 miles to go to a safe harbor where we can baby the poor abused engines. But we have to get there. 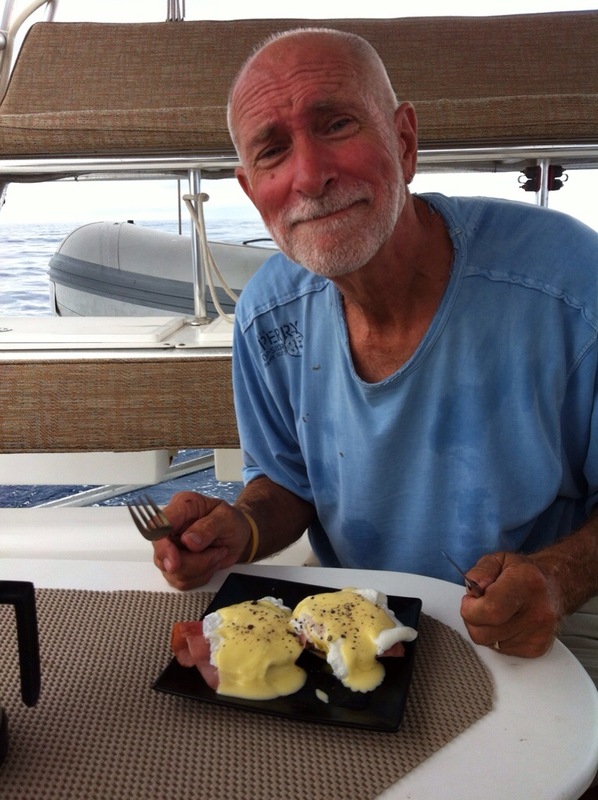 As Jack was cleaning up the mess in the port engine room, I thought we should at least have a great breakfast so I started to make Eggs Benedict. I could do this because yesterday when we ran out of bread I made English muffins, a first for me, and they turned out great. (Thank you Mark Bittman.) I was in the middle of making Hollandaise when the propane ran out. Since Jack was still writing the Big Book of Swear Words in the basement, I thought it wise to sit tight and wait for that storm to pass before I broke the news. Outside we ran through a rain squall and when Jack came up sweaty and frustrated from the port engine room I told him about the propane. He started toward the deck for a new tank but I said wait ’til the rain stops. No hurry. We both finished cleaning up the port engine room, checked that the engine ran ok, even with a slight seeping from the cursed fuel pump vent screw. When the rain passed Jack swapped out the propane tank and I proceeded to make the Hollandaise and toast the English muffins. Jack fried up some ham for his (no Canadian bacon on board) and I cooked some broccoli for mine. Finally four poached eggs and we were done, a fantastic breakfast that took the edge off the morning. It was only 10 o’clock. 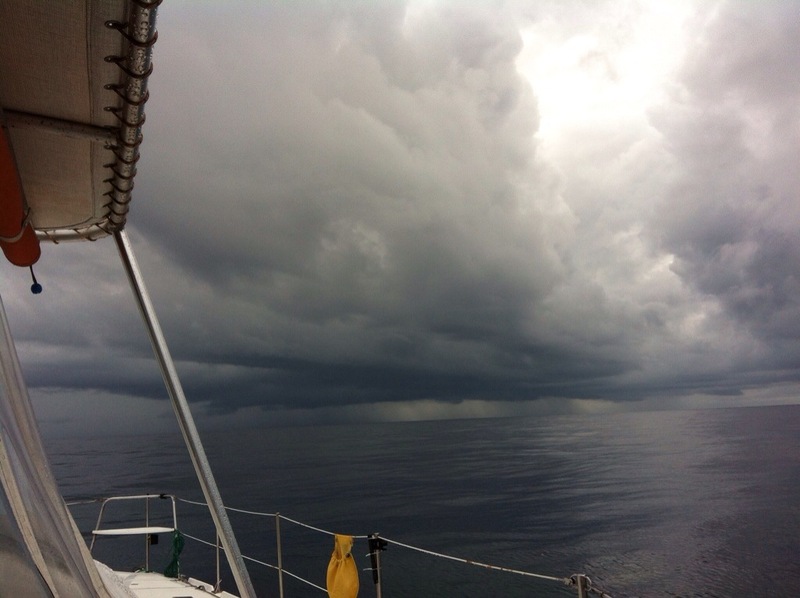 We were enjoying our second cup of coffee when we entered a serious squall, with high wind, sheeting rain and lumpy seas. Without sails we just throttled back so we wouldn’t bounce around so much and watched on the radar screen to see how long we’d have to put up with it. We hooked up the water collector filter and filled our water tank. When the rain let up Jack checked the dinghy and said we needed to get some of the water out. The plug was pulled, so you’d think the dinghy wouldn’t hold so much water but it’s deeper in the bow than the stern and water collects there; the drain is in the stern. This is a two person job. I crawled over the storage bins behind the cockpit underneath the stadium seat. From there I could hang over the edge of the dinghy and fill the bailer but couldn’t reach to empty it. So Jack climbed up on the stadium seat directly above me and I passed the filled bailer to him and he emptied it overboard. We repeated this umpteen times until we got most of the water out of the bow. It’s now 1pm. The sky has lightened a little but we see on radar another squall ahead of us. If it drops that much rain again we’ll have to repeat the bailing routine. For now, we’re putting our feet up and hoping for an uneventful afternoon. One more night. Fingers crossed. I bought every R-24-T fuel filter that they had in the Galapagos. Yep, all six and at $38.00 per, I’m glad that’s all they had because I’d have gotten more if they’d had them. It’s a long hot dusty walk to the General Mechanico, who had just lifted $120.00 cash from my frayed, sad-looking wallet to repair Escape Velocity’s never-used-by-us, but apparently much abused fuel transfer pump which is used to move fuel from the fifty-gallon front auxiliary tank up to our 100 gallon main tank. We’d just paid $1,600.00 cash up front, for another one of those surreptitious fuel deliveries plus six of the ubiquitous seventeen gallon blue plastic jugs that you see all over the third world. I wonder what originally comes in them? As I was saying, cash was getting kind of thin and we still hadn’t had our “last supper” so we found a restaurant that actually took credit cards and gathered the usual suspects for our traditional happy trails event. Looking out over the harbor there were all manner of boats but they all had one thing in common. They were all stuck waiting for parts. Waiting for deliveries is a full time hobby here in the Galapagos. Packages have to go through mainland Ecuador before being transfered to the Galapagos and well, you know…what could go wrong there? Conversation typically revolves around tracking numbers, empty promises like maybe Monday, or rumors of workarounds that somebody heard somebody had tried once. Patience, a fatalistic attitude, a thorough understanding of the Spanish word manana, and a healthy dose of humor are the requirements. All those thoughts were on my mind as we putted out past the dwindling number of boats in Puerto Ayora or maybe Losers Bay is a better way to put it. We had lost a few things too. All those skippers are facing a tough decision on whether at this late date they can continue on to the Marquesas or not. It didn’t take long before the now familiar engine stumbling started and my stash of fuel filters didn’t look so phat. EV’s starboard engine, known as the evil twin in Manta circles because for some reason they tend to run hotter than the port engine, suddenly dropped dead. The skipper may have grumbled something under his breath on the way down to the basement. Marce says I’m channeling Ralphie’s dad in A Christmas Story. I don’t know about that but I do like that leg lamp. We siphoned three blue jugs into the main tank and I had to change another fuel filter, this time the offender was the port engine. I confess the stress level is getting to me. If I can’t keep those Volvos running we’ll become just so much driftwood. It’s hard to believe that thirty gallons of dirty fuel, courtesy of our friends at Isla Isabela can cause so much stress. Once again our ocean current source has shown us where to tiptoe around counter currents and where to find a free ride. It’s amazing how fast these currents can change. For two days we’ve been running at 5.5 – 7 kts. 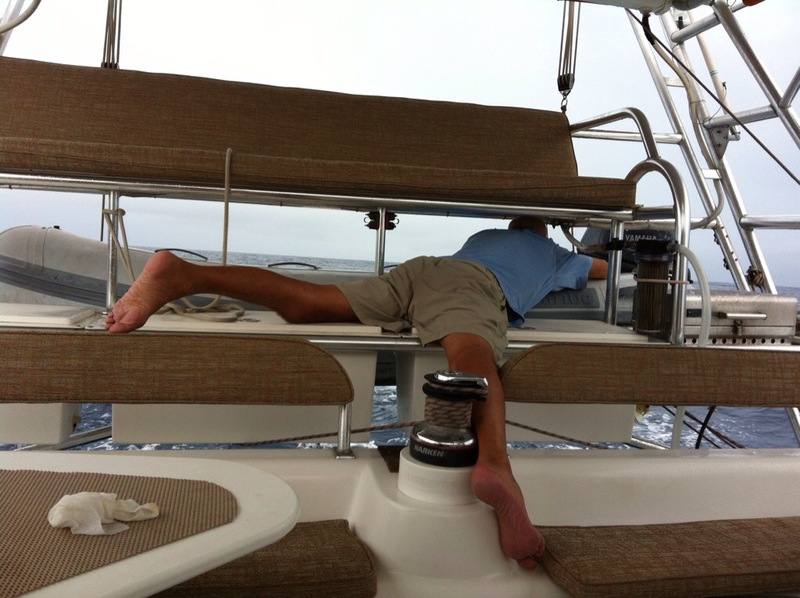 when we would expect to be at 4.5 kts. at this RPM. Fingers crossed, touch wood, turn around three times and spit.